Teoxane RHA x VCIP Serum – A NEW generation of Vitamin C , combined with Teoxane’s powerful RHA technology, to combat pigmentation, loss of firmness and a dull complexion. 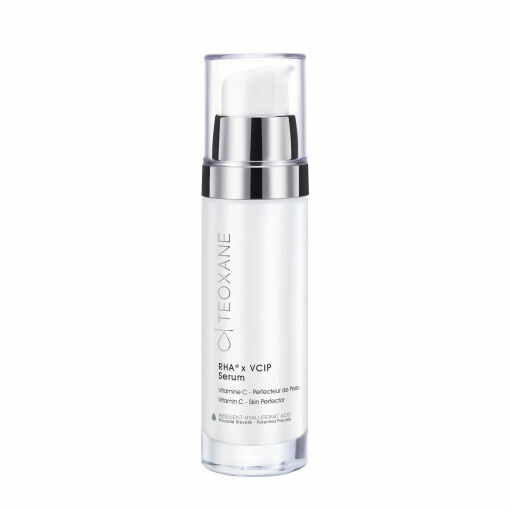 this advance serum maximises skin radiance by anti-pigmentation antioxidants, hydrating and correcting skin tone. RHA® x VCIP Serum brings together TEOXANE’s RHA® and VC-IP, a stabilised form of Vitamin C acknowledged by dermatologists for its anti-aging properties: antioxidant activity, brightening effect and skin collagen stimulation. RHA® x VCIP Serum will improve the appearance of pigmentation, aged skin and brighten the complexion. Apply a few drops of the serum to freshly cleansed skin. A day time complexion brightener, lightly massage across the face, neck and décolletage each morning. Leave to absorb for two minutes before applying Advanced Filler or Advanced Perfecting Shield. AQUA (WATER), ASCORBYL TETRAISOPALMITATE, GLYCERIN, PHOSPHATE BUFFERED SALINE, 1,2-HEXANEDIOL, POLYMETHYL METHACRYLATE, GLYCERYL STEARATE, PEG-100 STEARATE, METHYLPROPANEDIOL, ACRYLATES/C10-30 ALKYL ACRYLATE CROSSPOLYMER, ETHYLHEXYLGLYCERIN, PARFUM (FRAGRANCE), CHLORPHENESIN, STEARYL ALCOHOL, CAPRYLHYDROXAMIC ACID, DISODIUM EDTA, XANTHAN GUM, SODIUM PYRUVATE, TOCOPHEROL, SODIUM HYDROXIDE, SODIUM HYALURONATE CROSSPOLYMER-2, DISODIUM ACETYL GLUCOSAMINE PHOSPHATE, GLYCINE SOJA (SOYBEAN) OIL, GLUTATHIONE, PYRIDOXINE HCL, THIOCTIC ACID, ACETYL CYSTEINE, LYSINE HCL, VALINE, ISOLEUCINE, LEUCINE, THREONINE, ARGININE, GLYCINE, ZINC ACETATE, PROLINE, COPPER SULFATE.